Happy Holidays everyone and welcome to the annual Great Holiday Give. Five days of free fun for the whole family. Actually, just five days of giveaways for five lucky winners, but you get the point. But before time gets away from me, let's talk about today's give. 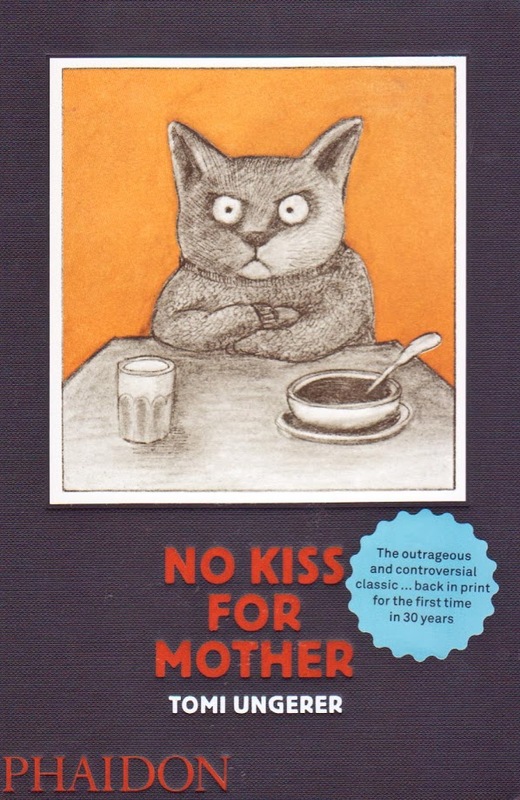 One reprint copy of the ever amazing No Kiss For Mother by Tomi Ungerer, a give hosted by the amazing folks at Phaidon Press who have been systematically republishing the bulk of all Tomi's backlist. All you have to do to win this perfect stocking stuffer is comment on this post between now and midnight (CT), Sunday, December 9. A winner will be selected at random and announced the next morning. That simple. And fun. Come back every day this week for a chance to win a new prize. Think of it as something to look forward to. Like an advent calendar of books! Love the look of this one, and the idea of Advent treats for grown-ups! This is one I don't have - would love to win a copy. What a great book! Not sure if your giveaway is open to a book lover from Canada, but it doesn't matter. I just had to tell you how much I love this book, and your blog. What a great book! Not sure if your giveaway is open to a book lover from Canada, but if not, no matter. Just wanted to say how much I love this book and your blog. We always love the books you recommend. We'd love to win! Yay! This book is on my wish! I've heard of this one, but never had the chance to read it. Excellent illustrations! Oooh oooh oooh- I would love it! What a great giveaway--how wonderful this is back in print. So fun to read your blog again! Eek, how fun! I love Tomi Ungerer!!!! Having a No Kiss for Mother moment right now with my five year old. What a treat to be able to win one! Thanks! We'd love a new book. The cover kitty looks just like my daughter! ah! i LOVED this book when i was little. Looks awesome ! thanks ! This one has been on our wish list! This book has been on my Amazon wish list for months! Thanks for the chance to win! Tomi Ungerer's wisdom, illustrations and wit are loved by my kids in France as they were my favourite as a kid in America. I'm not familiar with this book, but I love the look on that cat's face! It looks just like our cat! This would be such fun to read with my kids! What a great book. Love to have this for my granddaughter. Thanks! Love everything he does. And these Phaidon reprints are very nicely done. Hadn't heard of this one before. Looks wonderful. Would love to read it to my 3 (soon to be 4). I'm such a big Tomi fan! Saw & reposted a great video/interview you posted of his about a year ago & was hooked ever since. I'm intrigued by this re-print. Thanks for the chance to win! I love the look of that grumpy cat! We have loved Tomi Ungerer, a great bridge to chapter books. Unfortunately NYPL has too few of his in circulation. Want! we have loved tomi ungerer as a great bridge to chapter books. unfortunately nypl has too few of his in circulation. Yay! I'm a big big Tomi Ungerer fan and we don't have this book. Count me in. Thank you for arranging this giveaway! I haven't heard of this one, but I'm sure it will be great as all your recommendations. Thanks for the chance! Love this chance to win. I remember your prior review of this book. We'd be delighted to have a copy. Thanks! Thanks for another great book recommendation! A wonderful book! Tomi is the best!